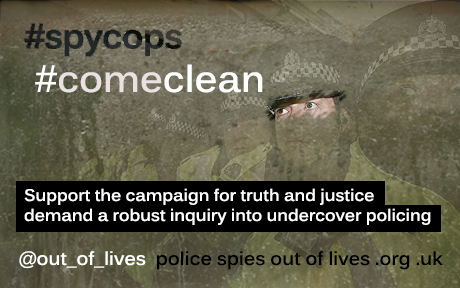 We call for a transparent, robust and comprehensive public inquiry into undercover policing. We demand truth and justice for the women deceived into intimate relationships by undercover police officers and all those affected by police spying on social and environmental justice groups. Everyone has the right to participate in the struggle for social and environmental justice, without fear of persecution, objectification, or interference in their lives. However, many campaigns and individuals have been targeted by Britain’s undercover police for decades, undermining efforts for social justice that should be welcomed in a democratic society. Citizens have been spied on, psychologically and emotionally manipulated, and abused by officers for being part of, or simply knowing people who were part of, such campaigns. We welcome the announcement of a full public inquiry into political undercover policing, but it must be truly transparent, robust and comprehensive. * Protect police whistleblowers from prosecution under the Official Secrets Act and encourage current and former officers to give evidence. * Cover all undercover police units from 1968 to the present day. * Ensure the police fully cooperate with the inquiry and do not obstruct its operation though the use of their ‘Neither Confirm Nor Deny’ stance. * Hold senior police officers past and present, especially former Met Commissioners and Special Branch Commanders, to account for any wrong doing attributed to the units under their command. * Investigate officers sharing or selling information and experience acquired through undercover policing to the private sector. * Make recommendations to change the law, especially the Regulation of Investigatory Powers Act (2000), to prevent these abuses from continuing. I agree to Police Spies Out Of Lives contacting me by email about more of their campaigns. Having been given a wide and unspecific remit for the public inquiry in to undercover policing on Thursday, Lord Justice Pitchford is due to announce what direction it will take in the next few days. We must keep up the pressure to ensure those affected, the same people that uncovered much of information leading to this inquiry, get truth and justice from this process. Over 200 signatures in just one day - please keep sharing!